Download "Practice Problems on the Capital Market"
1 Practice Problems on the Capital Market 1- Define marginal product of capital (i.e., MPK). How can the MPK be shown graphically? 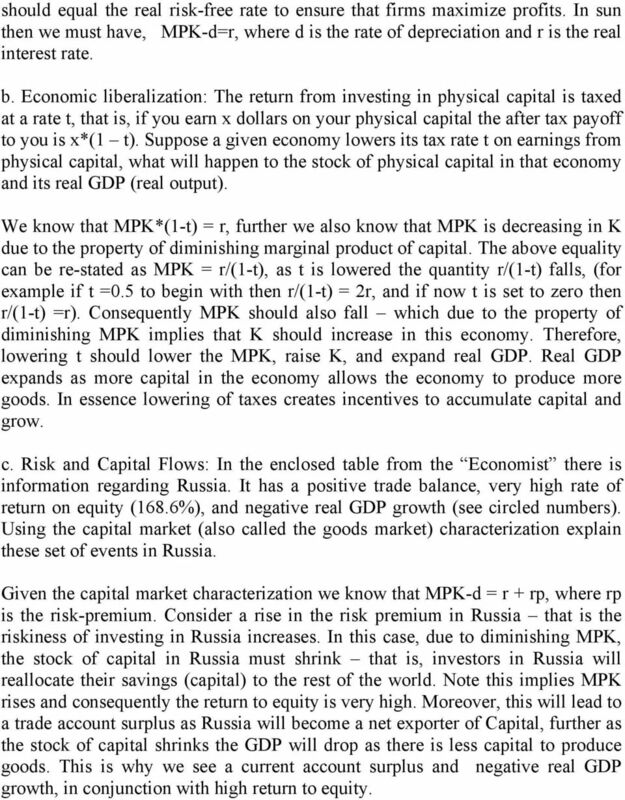 The marginal product of capital (MPK) is the output produced per unit of additional capital. The MPK can be shown graphically using the production function. For a fixed level of labor, plot the output provided by different levels of capital; this is the production function. The MKP is just the slope of the production function. 2- What effect does a temporary increase in government purchases- for example, to fight a war- have on desired consumption and desired national saving, for a constant level of output? When government purchases increase temporarily, consumers see that higher taxes will be required in the future to pay off the deficit. They reduce both current consumption and future consumption, but current consumption declines by less than the amount of the government purchases. Since national saving is output minus desired consumption minus government purchases, and government purchases have increased more than current desired consumption has decreased, national saving declines at a given real interest rate. 3- What is the desired capital stock? How does it depend on the expected future marginal product of capital? The desired capital stock is the amount of capital that allows the firm to earn the largest possible profit. The higher the expected future marginal product of capital, the higher the desired capital stock, since any given amount of capital will be more productive in the future. The higher the user cost of capital, the lower the desired capital stock, since a higher user cost yields lower profits on each unit of capital. The higher the effective tax rate, the lower the desired capital stock, again because the firm gets lower profits on each unit of capital. 4- What is the difference between gross investment and net investment? Can gross investment be positive when net investment is negative? Gross investment represents the total purchase or construction of new capital goods that takes place during a period. Net investment is gross investment minus the depreciation on existing capital. Thus net investment is the overall increase in the capital stock. Yes, it is possible for gross investment to be positive when net investment is negative. This occurs whenever gross investment is less than the amount of depreciation (and, in fact, happened in the United States during World War II). 2 5- Explain why the saving curve slopes upward and the investment curve slopes downward in the saving-investment diagram. Give two examples of changes that would shift the saving curve to the right, and two examples of changes that would shift the investment curve to the right. The saving curve slopes upward because saving is assumed to increase with an increase in the expected real interest rate. The investment curve slopes downward because investment is lower the higher is the expected real interest rate. The saving curve would be shifted to the right by an increase in current output, a decrease in expected future output, a decrease in wealth, a decrease in government purchases, and possibly by a rise in taxes. The investment curve would shift to the right by a decline in the effective tax rate or a rise in expected future marginal productivity of capital. 6- A country loses much of its capital stock to a war. a- What effects should this event have on the country s current employment, output, and real wage? 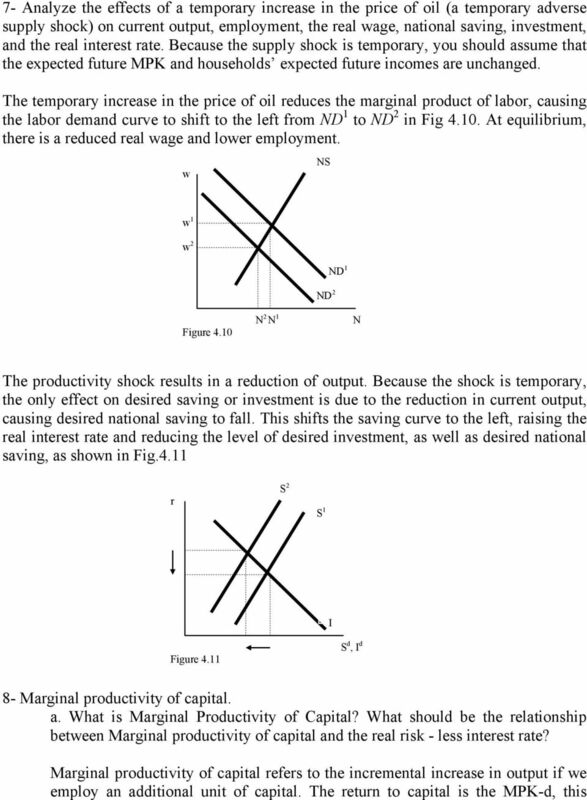 With a lower capital stock, the marginal product of labor is reduced, so the labor demand curve shifts to the left from ND 1 to ND 2 in Fig The labor market equilibrium is one with lower employment and a lower real wage. With lower employment and a lower capital stock, output will be lower as well. w NS ND 1 ND 2 Figure 4.8 N b- What effects will the loss of capital have on desired investment? Because the capital stock is lower, the marginal product of capital will be higher, so desired investment will increase. The economy will want to rebuild the capital stock. 4 should equal the real risk-free rate to ensure that firms maximize profits. In sun then we must have, MPK-d=r, where d is the rate of depreciation and r is the real interest rate. b. Economic liberalization: The return from investing in physical capital is taxed at a rate t, that is, if you earn x dollars on your physical capital the after tax payoff to you is x*(1 t). Suppose a given economy lowers its tax rate t on earnings from physical capital, what will happen to the stock of physical capital in that economy and its real GDP (real output). We know that MPK*(1-t) = r, further we also know that MPK is decreasing in K due to the property of diminishing marginal product of capital. The above equality can be re-stated as MPK = r/(1-t), as t is lowered the quantity r/(1-t) falls, (for example if t =0.5 to begin with then r/(1-t) = 2r, and if now t is set to zero then r/(1-t) =r). Consequently MPK should also fall which due to the property of diminishing MPK implies that K should increase in this economy. Therefore, lowering t should lower the MPK, raise K, and expand real GDP. Real GDP expands as more capital in the economy allows the economy to produce more goods. In essence lowering of taxes creates incentives to accumulate capital and grow. c. Risk and Capital Flows: In the enclosed table from the Economist there is information regarding Russia. It has a positive trade balance, very high rate of return on equity (168.6%), and negative real GDP growth (see circled numbers). Using the capital market (also called the goods market) characterization explain these set of events in Russia. Given the capital market characterization we know that MPK-d = r + rp, where rp is the risk-premium. Consider a rise in the risk premium in Russia that is the riskiness of investing in Russia increases. In this case, due to diminishing MPK, the stock of capital in Russia must shrink that is, investors in Russia will reallocate their savings (capital) to the rest of the world. Note this implies MPK rises and consequently the return to equity is very high. Moreover, this will lead to a trade account surplus as Russia will become a net exporter of Capital, further as the stock of capital shrinks the GDP will drop as there is less capital to produce goods. This is why we see a current account surplus and negative real GDP growth, in conjunction with high return to equity. 6 9- The Slovenian production function is given by y=a K^0.35 *N^0.65. Assume that N is fixed at 1 (million workers) and that A is fixed at In 1991, immediately after the war for independence, Moody's rated Slovenian sovereign debt at Ba1. This meant that Slovenia had to pay a premium of 3 percentage points over the world real interest rate R. Assume that R is constant and equal to 3% and that depreciation is equal to 100% Note that r=r+d, with d=1, hence r=1+r. a. Compute the magnitude of real investment in Slovenia in The cost of capital in Slovenia is R+rp. The user cost of capital is d+r+rp. (Note, if you chose the overall user cost of capital to be 6%, your solution will look different, but you will receive full credit for the answer.) Investment in 1991 is equal to the amount of capital that Slovenian firms want to have in place in It follows 1+R+rp=E[MPK] = 0.35*A*[N/ K 1992 ]^ = 0.35 * 1.96* [1 / K 1992 ]^0.65 It follows that K 1992 is equal to K 1992 = [0.35 * 1.96 / 1.06]^(1/0.65) = b. Compute the real wage in Slovenia in The real wage is equal to the marginal product of labor. It follows MPN = 0.65 * A*(K 1992 / N)^0.35 = 0.65 * 1.96 *(0.512 / 1)^0.35 = c. Slovenia improved its credit rating to A3 in The risk premium fell to 1%. 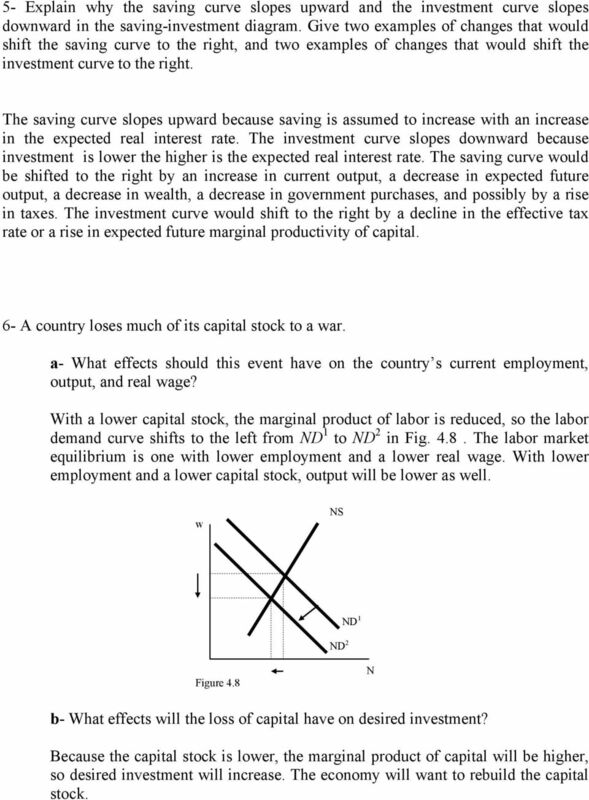 Compute the real wage in First compute the capital stock in We get K 2000 = (0.35 * 1.96 / 1.04)^(1/0.65) = The real wage is equal to the marginal product of labor. It follows MPN 2000 = 0.65*A*(K 2000 / N))^0.35 = 0.65 * 1.96 *( / 1)^0.35 = d. Compute the percentage change in living standards (that is the real wage) in 2000 relative to 1992. 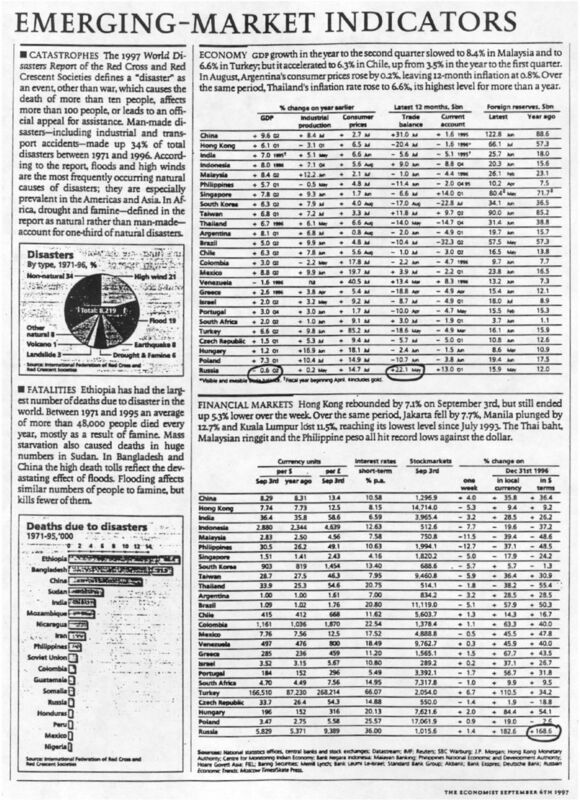 7 Percentage change in real wages from 1992 to 2000 is (( / ) -1) * 100 = 1.03% It would be equally legitimate to compute living standards base on output per worker. 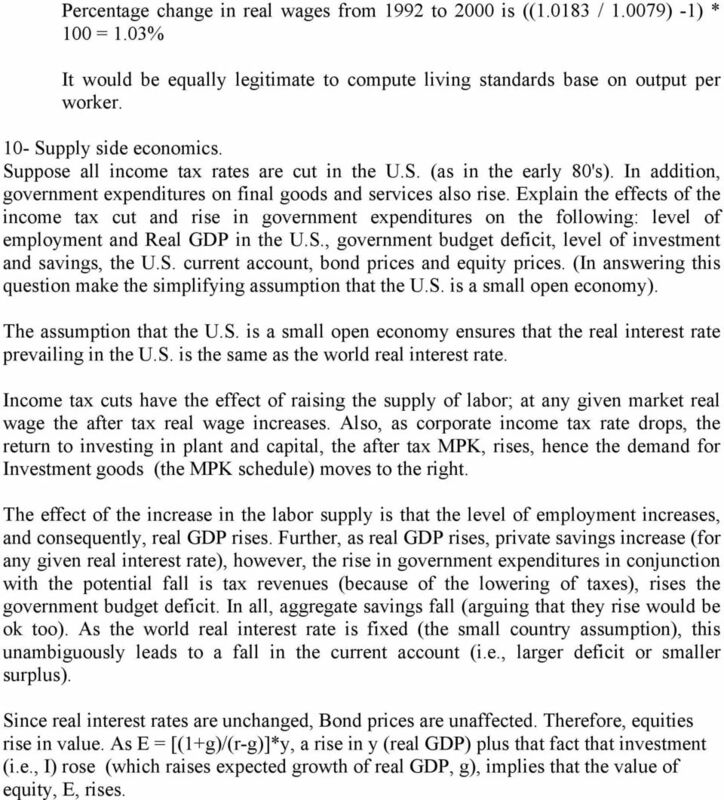 10- Supply side economics. Suppose all income tax rates are cut in the U.S. (as in the early 80's). In addition, government expenditures on final goods and services also rise. Explain the effects of the income tax cut and rise in government expenditures on the following: level of employment and Real GDP in the U.S., government budget deficit, level of investment and savings, the U.S. current account, bond prices and equity prices. (In answering this question make the simplifying assumption that the U.S. is a small open economy). The assumption that the U.S. is a small open economy ensures that the real interest rate prevailing in the U.S. is the same as the world real interest rate. Income tax cuts have the effect of raising the supply of labor; at any given market real wage the after tax real wage increases. Also, as corporate income tax rate drops, the return to investing in plant and capital, the after tax MPK, rises, hence the demand for Investment goods (the MPK schedule) moves to the right. The effect of the increase in the labor supply is that the level of employment increases, and consequently, real GDP rises. Further, as real GDP rises, private savings increase (for any given real interest rate), however, the rise in government expenditures in conjunction with the potential fall is tax revenues (because of the lowering of taxes), rises the government budget deficit. In all, aggregate savings fall (arguing that they rise would be ok too). As the world real interest rate is fixed (the small country assumption), this unambiguously leads to a fall in the current account (i.e., larger deficit or smaller surplus). Since real interest rates are unchanged, Bond prices are unaffected. Therefore, equities rise in value. As E = [(1+g)/(r-g)]*y, a rise in y (real GDP) plus that fact that investment (i.e., I) rose (which raises expected growth of real GDP, g), implies that the value of equity, E, rises.